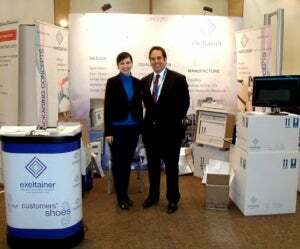 In February the ninth annual Cold Chain Storage and Distribution Conference took place in London. There, Exeltainer had a wonderful opportunity to share with its European partners the latest information about pharma cold chain distribution and to present its innovative insulated packaging designs such as front-loading shippers in different payload measures, new 2°C-8°C configurations with no gel-pack pre-conditioning, and 2°C-8°C clinical trials insulated packaging qualified up to 96 hours. This event was an excellent way to establish key contacts and expand networking, looking forward to reach positive partnerships. For further information please click the Company Details tab above to visit our company profile. Our brochure is available to download from our White Papers page.